First Contra Dance of the Semester! It’s a new semester, a new year and therefore a perfect time to try something new and meet new friends! Come to the first Wes Contra Dance of 2012. Live music provided by talented Wesfolks Rebecca McCallum, Emily Troll, and Josh Van Vliet. Luke Donforth will be calling. As always, all dances are taught. No partner needed! Everyone is welcome! 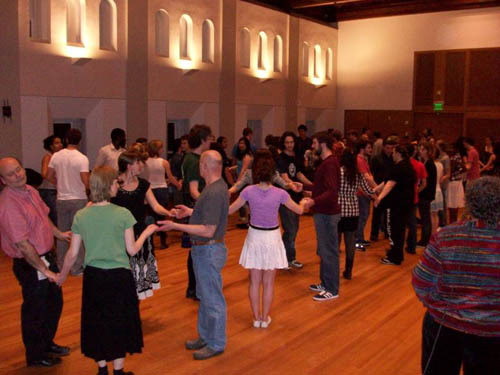 There will be a swing/blues dance immediately following the Contra dance. Come for that too! Posted by Samira in Campus Life, Culture, Events, General, Music, Student Groups and tagged beckham hall, Contra Dance, Fiddles on February 3, 2012 at 4:41 PM.